Здесь вы можете прочитать биографию Николая Гоголя на английском языке. Nikolai Vasilievich Gogol (20 марта [1 апреля] 1809 года - 21 февраля [4 марта] 1852 года) - Russian writer. Nikolai Vasilievich Gogol was born on 20 March 1809 in the village of Sorochyntsi. It was situated in Poltava Governorate of the Russian Empire. Now this territory belongs to Ukraine. The ancestors of Gogol’s mother were Polish landowners. It is known that his father, Vasily Gogol-Yanovsky, composed poetry both in Russian and Ukrainian. He died when Nikolai was fifteen years old. The whole family spoke both Ukrainian and Russian. When Nikolai was a child he helped his uncle with various plays in his home theater. From 1820 to 1828 Gogol studied at a school of higher art which was located in Nizhyn. At that time he started to write. Gogol did not have many friends at school and some of his classmates called him “mysterious dwarf”. At the same time two or three of his schoolmates became his close friends. At an early age Gogol developed taciturn temperament which was expressed by distressing self-consciousness and infinite ambition. He additionally developed a faculty for mimicry. Consequently Gogol became an incomparable reader of his writings and had an idea to be an actor. In 1828 he left the school and moved to St Petersburg. Gogol dreamt of being literary celebrity and brought with him a poem Hans Kuchelgarten. It was later published entitled “V. Alov”. Gogol sent his work to different magazines but most of them ridiculed it. Afterwards he bought all the magazines and destroyed them. After that Gogol swore that he’d never begin writing again. In 1831Gogol presented Ukrainian stories (Evenings on a Farm Near Dikanka). This work was a great success. In a year he presented the second volume of these stories. In 1835 two volumes were in the collection of stories called Mirgorod. During this time Russian critics saw in Gogol the emergence of a Ukrainian, rather than Russian. Afterwards his writings were used for illustrating differences between Ukrainian and Russian national characters. At the same time Gogol became interested in Ukrainian history. He tried to get a job at the history department at Kiev University. The Russian minister of education and Pushkin tried to help him but eventually Gogol couldn’t obtain an appointment at this university. Gogol’s interest in history was an incitement to him to write a fictional story Taras Bulba where he described Ukrainian Cossacks. At this time Gogol became friends with Mykhaylo Maksymovych who was a naturalist and historian. In 1834 he became Professor of Medieval History at the University of St. Petersburg. From 1832 to 1836 Gogol worked hard and during this time he was in touch with Pushkin. In April 1836 he presented his comedy The Government Inspector (Revizor). This work was an enormous success and after this event other Russian critics such as Vissarion Belinsky and Stepan Shevyrev reclassified Gogol from a Ukrainian to a Russian writer. Between 1836 and 1848 Gogol travelled abroad. His tour included a visit to Switzerland, Germany, France, Italy and other countries. 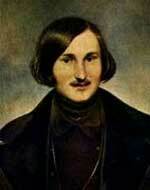 In the winter of 1836-1837 Gogol stayed in Paris where he was in touch with Polish exiles and Russian expatriates. He spent a lot of time with the Polish poets Bohdan Zalesky and Adam Mickievicz. Gogol finally moved to Rome where he spent most of his twelve years from 1836. He became interested in Italian literature, opera and art. In 1838 Gogol made the acquaintance of Count Ioseph Vielhorskiy who was 23 years old. He suffered from tuberculosis and Gogol tried to help him but Vielhorskiy died in a year. In 1837 Pushkin died and this event made a lasting impression on Gogol. After Pushkin’s death his main work was the satirical epic Dead Souls. At the same time Gogol amended The Portrait and Taras Bulba. Moreover he wrote the second comedy Marriage (Zhenitba) and started working on his noted short story, The Overcoat. In 1841 Gogol completed the first part of Dead Souls and brought it to Russia. This work was presented in 1842. The censorship insisted on renaming of the book. Eventually it was entitled The Adventures of Chichikov. This work made Gogol famous. Gogol spent his last years travelling throughout the country. He also spent a lot of time with his friends such as Osyp Bodiansky, Sergei Aksakov, Maksymovych and others. His health declined. In February 1852 Gogol destroyed some of his manuscripts including the second part of Dead Souls. 9 days later he died. Gogol was buried in the Novodevichy Cemetery.